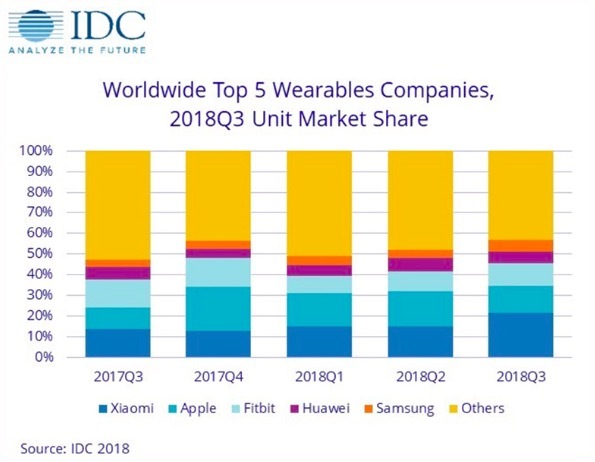 In the third quarter of 2018, Global Shipments of wearable devices reached 32 million units. It was 21.7 percent up from the previous year. This rise in shipment was forced by mainly Xiaomi and Apple. Xiaomi shipped 6.9 million units during this time period and grabbed the market share of 21.5 percent. Apple was at second place with 13.1 percent share and shipped 4.2 million wearable devices. Fitbit was at the third place and shipped 3.5 million wearables globally to get 10.9 % market share. Huawei and Samsung were at the fourth and fifth place with 1.9 percent and 1.8 percent market share respectively. Fitbit and Huawei both saw a decline in market share as compared to Q3 17 numbers, but Samsung managed to rise in this segment. The launch of Mi Band 3 and international expansion helped Xiaomi overtake Apple. Only 61% of Xiaomi shipments were domestic, compared to over 80% in previous quarters. India was another big market that helped Xiaomi a lot. Apple Watch Series 3 was the star performer for Apple and recently launched Series 4 Watch just accounts for 20% of its shipments. Wearable devices include both fitness tracker and smartwatches. Here one thing is important to note that Apple doesn’t provide details on the number of Apple Watch models that it sells. So, IDC has taken an estimated number that may not represent the actual sales figure. The growth of wearable shipment is mainly due to good sales in Asia/Pacific. In the U.S. the shipment declined by 0.4 percent.